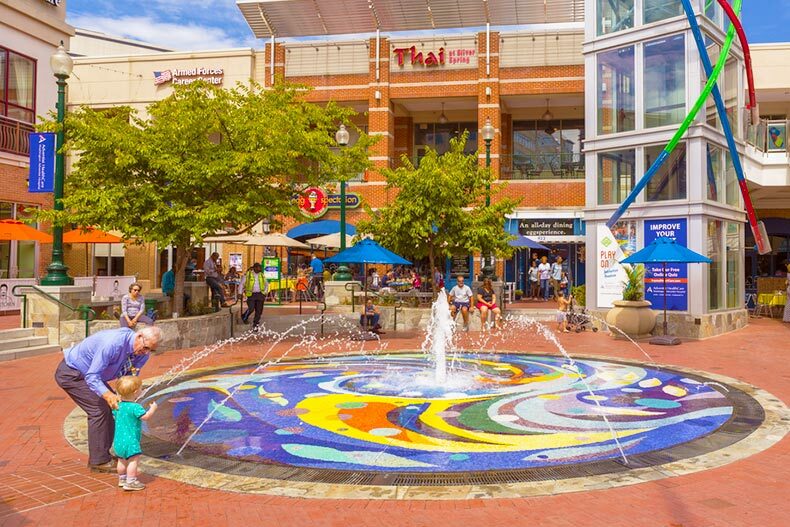 Leisure World residents can explore nearby Downtown Silver Spring with the grandkids. Though Maryland may not have as many active adult communities as other states, there are several 55+ neighborhoods to be found here. Maryland active adult communities have been built by a variety of developers, including Caruso Homes, Del Webb, and Summit Homes, at varying levels of luxury and price point. Regardless of the price level, you’ll find impressive amenities and active lifestyles are found in strong supply across the state. But if you’re looking for a 55+ living experience without breaking the bank, here are four communities you might want to consider. Located just minutes from Downtown Silver Spring, 30 minutes from Washington, D.C., and 40 minutes from Baltimore, Leisure World has everything an active but budget-conscious adult could ask for. Homes here start below $100K and go as high as the $500s. Prospective residents can choose from condominiums, attached homes, and single-family homes, all of which come with snow removal and yard work included. Set across 650 acres, this community has its own post office, bank pharmacy, medical center, and two different houses of worship within its gates. It also boasts two distinctly different clubhouses. The first clubhouse is home to a library, woodworking shop, travel office, ballroom, three restaurants, and several classrooms. The second clubhouse houses a fitness center, movie theater, auditorium for shows, meeting rooms, and an indoor pool. Leisure World of Maryland residents can also enjoy the trails, gardens, parks, and gazebos throughout the property. The community also has an 18-hole championship golf course complete with driving range and putting greens. For active adults who prefer some distance from the action of big cities, Crestwood Village may be an optimal choice. Located in Frederick, it offers affordable units in an established community. The social heart of Crestwood Village can be found takes place in its clubhouse, which includes a fitness center with both cardio and weight-training machines, an indoor spa, several meeting rooms, a library, and a computer room. Outside, residents have their choice of swimming, tennis, shuffleboard courts, and a nine-hole mini golf course. Crestwood Village has much to offer its active adult residents in the way of planned activities, such as potluck dinners, holiday parties, movie nights, dancing, yoga, and Zumba. Prospective homebuyers have their choice of resale homes that are either attached or single-family homes. Attached homes come as quads or duplexes that offer between 900 to 1,332 square feet of living space. These attached homes generally have one or two bedrooms, one or two bathrooms, and an attached, one-car garage. Single-family homes typically offer between 609 to 1,960 square feet of living space, with two bedrooms, and up to two-and-a-half bathrooms. These homes are usually ranch-style and feature spacious master suites, large living and dining rooms, screened porches, and attached one-car garages. 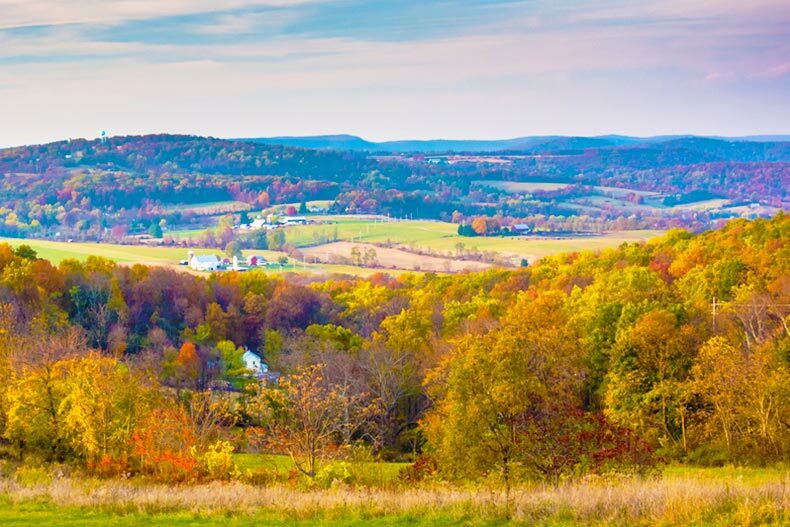 The rolling hills of rural Frederick County in Maryland. Active adults looking for affordability combined with outstanding features will feel right at home in Cameron Grove, an age-restricted community in Upper Marlboro, just 30 miles west of Washington, D.C. and 20 miles east of the Chesapeake Bay area. Cameron Grove offers a choice of 740 homes, ranging from condos to single-family homes within the high $100 to high $200 price range. Prospective homeowners have a choice of condominiums, attached cottage homes, and single-family homes, on a resale-only basis. Cameron Grove’s cottages are especially unique and offer low-maintenance living at its best. The square footage on these cottages ranges from 1,696 to 2,163 square feet of living space with two or three bedrooms, two to three bathrooms, and an attached two-car garage. One of the main features of the community is the Cameron Grove Resort Center, a 20,000 square-foot clubhouse in the heart of this community. Here, residents can enjoy watching films in the movie theater, hanging out in the lounge or bar, or staying healthy at the fitness center. The clubhouse also features an arts and crafts room, a library, a grand ballroom, a private dining room, and a computer lab. Outdoors, residents can enjoy an outdoor pool in the summertime, tennis matches on Cameron Grove’s courts as well as numerous walking and biking trails. The Overlook at McPhail Woods in Bel Air has thought of everything so their active adult residents don’t have to. Although the Overlook at MacPhail Woods is convenient to local shopping and nearby attractions, it is only 40 minutes to the big-city offerings of Baltimore as well as the Baltimore/Washington International Airport. This intimate community sits on 34 acres of wooded landscaping providing scenic views, nature trails, and lovely outdoor parks. The community room is the social hub of the community. Residents are free to use the exercise equipment to stay in shape or they can join their fellow residents around the television for a movie night. The Overlook offers both new and resale homes. Each condo building has four stories, each featuring an underground parking garage, electronic entry doors, and elevator access. The condo units are spacious, ranging from 1,303 to 1,714 square feet with two bedrooms and two or two-and-a-half bathrooms. Homeowners enjoy a low-maintenance lifestyle thanks to a homeowners’ association (HOA). The HOA fee includes lawn care, exterior building maintenance, snow and trash removal, water, and general upkeep of the facilities, leaving residents free to maintain their active lifestyle.